Pears come in two “flavors:” European and Asian. European pears, which are most familiar in American markets, are typically buttery, sweet, and richly aromatic — and pear-shaped. Asian pears are typically round with crisp flesh that, when you take a bite, explode in your mouth with juice. Their flavors are sweet with a delicate, floral aroma and sometimes a hint of walnut or butterscotch. Both kinds of pears have been cultivated for thousands of years, and within each type exists thousands of varieties. Pears of either “flavor” are easy to grow. But growing and ripening a European pear to its highest state of perfection is an art. The best one I ever tasted was at a horticultural conference at the venerable East Malling Research Station in England. At the conclusion of the conference we were led into an elegant, large, wood-paneled room, up the center of which ran a hulking, oak banquet table on which sat nothing more than a few bowls of perfectly ripened ‘Comice’ pears, ours for the tasting. I reached for a pear, took a bite, and quickly had to make my way to the conveniently opened French doors at the far end of the room to keep the ambrosial juice dripping with each bite from marring the staid surroundings. Cultivation of European and Asian pears is essentially the same, with just a few subtle differences. Both need full sun and soil that is at least reasonably well-drained. 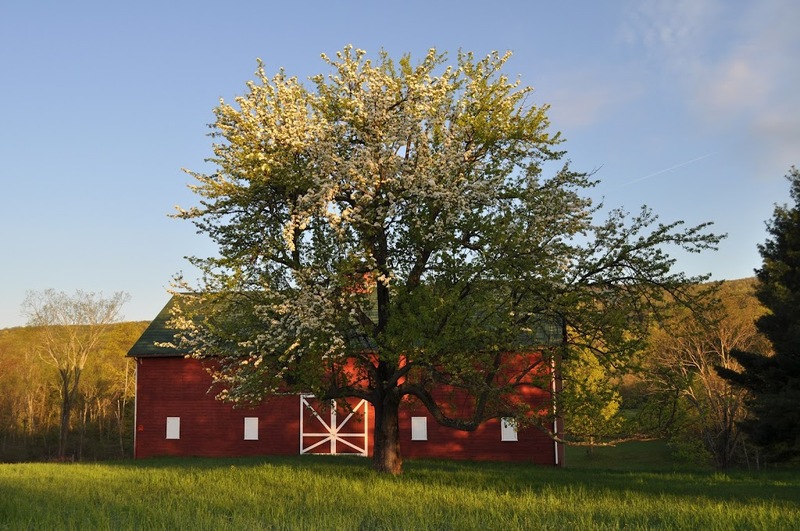 Pears can tolerate wetter soils than many other tree fruits. Among my favorite varieties are ‘Magness’ and ‘Seckel’ European pears, and ‘Yoinashi’ and ‘Chojuro’ Asian pears. Once a tree reaches bearing age, prune lightly every year. Completely remove some of the overly vigorous stems, which mostly originate higher in the tree, and merely shorten weak twigs, which mostly arise lower in the tree. Fruits are borne on spurs, which are short stems elongating only a half-inch each year. Periodically, shorten old branches more aggressively to stimulate growth of new shoots and spurs. 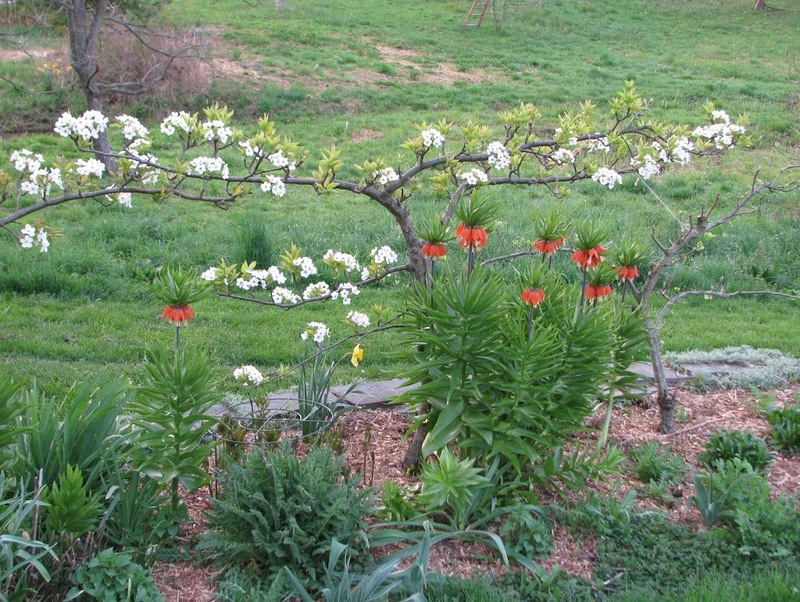 Asian pears need more aggressive pruning than European pears, although European pears, especially, are prone to growing many overly vigorous, vertical growing shoots, which shade the plant, are not fruitful, and are more prone to disease. Cut them back when pruning or, even better, grab them in your hand and rip them off with a quick downward jerk while they are still green and growing during summer. In most yards, pears can be grown successfully without any attention to pest control. Occasionally, a few pests warrant attention and action. 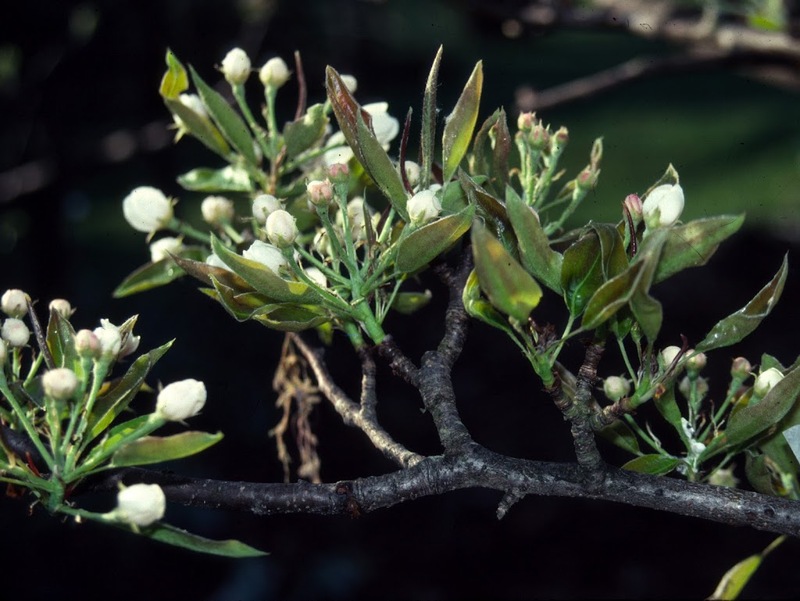 The main bugaboo in pear growing is the bacterial disease fire blight, readily identified by stems whose ends curl in shepherd’s crooks with seemingly singed, blackened leaves still attached. Diligent pruning out of blighted stems, cutting a few inches below damage, keeps the disease in check. Fire blight has never appeared on any of my more than a dozen trees. Now for the reward: harvest. Asian pears are precocious, sometimes fruiting in their third season, while European pears are slower to come into bearing. First, the easy harvest. Asian pears. Harvest them when they are fully colored and detach easily when you roll them upward with a twist. Taste is the final test: If flavor is not up to snuff, let the fruits hang longer. European pears must be harvested underripe. Left to fully ripen on the tree, the flesh is brown mush. The fruit must, however, be mature before it is picked and the first clue to fruit maturity is a subtle lightening of the skin’s background color. Look more closely, at the lenticels, or raised pores on the skin; they will become brown and corky at harvest time. Lift and twist the fruit. If the stalk separates easily from the stem, the fruits are ready for harvest. ‘Magness’ pear – mmmm, one of the best! You’re not yet in pear heaven. European pears need to be kept cool for awhile — a few days for early ripening varieties, a few weeks for late ripening varieties — before they can begin ripening. Keep them cool longer if you intend to store them. Take some pears out of cold storage a few days before you want them for eating and put them in a cool room. They are ready to enjoy when they give slightly with pressure from your finger near the stem end. If you’ve mastered the art of pear growing, harvesting, and ripening, your reward is fruits that are neither “sleepy” nor the other extreme, “grassy,” but juicy and sweet with characteristic aromas that might include varying proportions of almond, rose, honey, and musk. Still, to quote Ralph Waldo Emerson, “There are only ten minutes in the life of a pear when it is perfect to eat.” But what sensuous ten minutes! Perry is fermented pear juice, an old-fashioned beverage whose origin lies in France but reached its heyday in 16th and 17th century England. The juice was not your mother’s – or grandmother’s – pear juice. Pears for perry, a different species from European or Asian pears, are mostly too astringent for fresh eating. They’re also very long-lived: an avenue of perry pears planted in England in 1710 were reportedly still alive and fruitful in the mid-20th century. Perry is made like hard cider, except that perry pears need to sit for a few days after harvest for their flavors to develop. And again, after crushing, the pomace needs to sit for about a day to reduce the tannins. The end product is quite different from cider because perry pears have more fermentable and nonfermentable sugars, more citric acid, and different kinds of tannins. And because, of course, the raw material is pears. Traditionally, perry has been a very variable product, reflecting what varieties of perry pears went into the mix, how the mix was fermented, how the fruits were grown, and the vagaries of a particular season. The drink was very much a home- or farm-made beverage, varying as much in alcohol concentration as in flavor. After experiencing a lapse in interest and various attempts to industrialize the product in the 20th century, perry is undergoing a renaissance. Part of that renaissance lies in the re-discovery of some of the traditional perry pear varieties. ‘Arlingham Squash’, ‘Green Horse’, ‘Moorcroft’, ‘Rock’, and ‘Taynton Squash’ are among the varieties that have contributed to vintage quality perries for over three centuries. One problem with these old varieties is that their nomenclature is as muddled as the finished product can be in some years. Hundred of names exist for a much less number of varieties. Which isn’t all bad, because some of those names are worth having just because: ‘Mumblehead’, ‘Merrylegs’, ‘Devildrink’, ‘Lumberskull’, and, the longest one on record, ‘A drop of that which hangs over the wall’. Both workshops will be held at my “farmden,” run from 2-5:50 pm, and cost $55. Pre-registration is necessary. For information or registration, contact me at garden@leereich dot com. This entry was posted in Uncategorized and tagged Grow Fruit Naturally, new book, pear, perry. Bookmark the permalink. Trackbacks are closed, but you can post a comment.